Joining two time series at their most correlated segment can provide important information about their synchrony. Finding the most correlated join segments is time consuming. 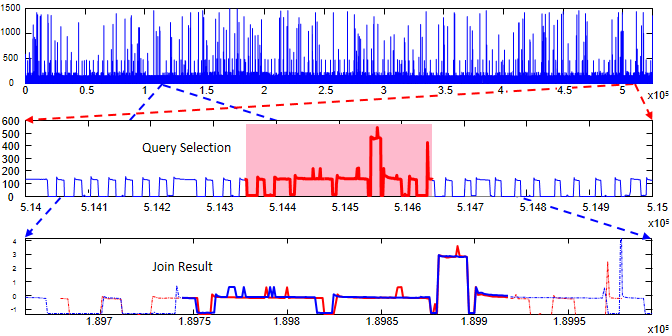 In this work we have shown an algorithm that finds the best join segment for two long time series or two sets of time series efficiently at an interactive speed. Below we show a join for two currency conversion rates. We have a C++ code and a MATLAB function for the joining. 1. C++ code: There is an external dependency on fftw3.h which can be downloaded from here. We have compiled results of all the experiments in a spreadsheet. All time measurements are in seconds. The dataset is taken from here.